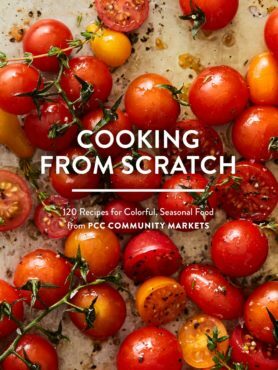 Editor’s note: This excerpt was adapted from “Cooking from Scratch: 120 Recipes from Colorful, Seasonal Food from PCC Markets,” recently released from Sasquatch Books. Used by permission. In the Pacific Northwest, when we experience several straight months of cool, overcast weather, it pays to be good friends with the soup pot. A classic simmering stew is a symbol of all the good parts of the chilly season — everyone’s warm and cozy, the house smells great, and a hearty meal is just a little while away. These days, roasting and other quick, hot methods of cooking vegetables reign supreme. There are plenty of good reasons for this, but it’s become something of a rarity to taste vegetables without rich caramelization. Soup is a means of rediscovering the simple, pure flavor of gently cooked seasonal ingredients, a way of sipping the season rather than crunching your way through it. Soup isn’t particularly thought of as a special-occasion food, but when you consider that chili and chowder are absolutely make-a-giant-pot-and-invite-everyone meals, you’ll notice how much socializing happens around bowls of soup. Something that’s slowly catching on as a January twist on the holiday cookie exchange is the soup swap. Make a few quarts of your favorite, invite your friends to do the same, and get together to sample and swap. Everyone goes home with a few containers of new varieties to stock their freezer with (and recipe cards, if they’re really lucky), and everyone’s had a cozy evening around, yes, soup. Canned chipotle peppers in adobo sauce are one of those magical ingredients that create layers of flavor with minimal effort. Here, their heat balances the sweet potatoes and corn, while enriching the beer-chicken broth base. Kept warm in a slow cooker, this hearty stew makes a fantastic lunch for midday football games and will go perfectly with the same lager you use in cooking. Leftover stew can also be frozen nicely for up to two months. In a large, heavy-bottomed soup pot over medium-high heat, heat the oil just until it shimmers. Add the pork in batches (don’t overcrowd the pot) and brown the pieces on all sides, 1 to 2 minutes per side. Using a slotted spoon or tongs, remove them from the pot and set aside in a bowl. Reduce the heat to low and add the onion and garlic. Cook, scraping the browned bits from the bottom of the pot, until the onions are deep golden, about 10 minutes. Add the browned pork, cumin, coriander, chipotle peppers, adobo sauce and salt and pepper to taste; stir to combine. Increase the heat to medium, pour in the lager and chicken broth, and bring to a boil. Reduce the heat to low, cover the pot and simmer for 1 hour, stirring occasionally. Add the sweet potatoes and corn. Cover and simmer until the pork is tender and the sweet potatoes are cooked through, 30 to 45 additional minutes. 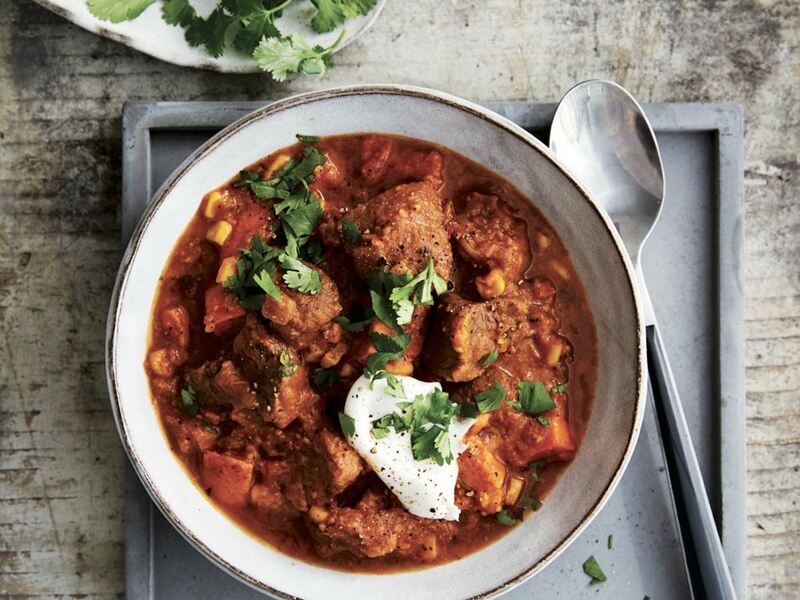 Ladle into bowls and top with cilantro and sour cream. Note: If you would prefer to skip the beer, just add an extra 1 _ cups chicken broth in its place. Cider pairing: Bold apple flavor is a classic choice for pork, particularly with a spicier recipe such as this. Both off-dry and semisweet blends can balance the heat from the adobo sauce.